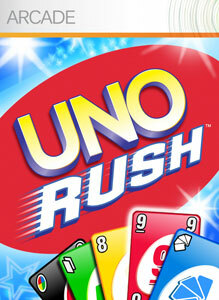 "UNO RUSH™ is a four-player, social party game that's easy to jump into, but hard to leave because you'll have so much fun playing. Sort your cards (even off-turn) so you can play them sequentially when it is your turn. The first player to get rid of all their cards wins the round, and scores points based on the remaining cards in opponents' hands. This fast-paced, family-friendly game is sure to become a hit with you and your friends."